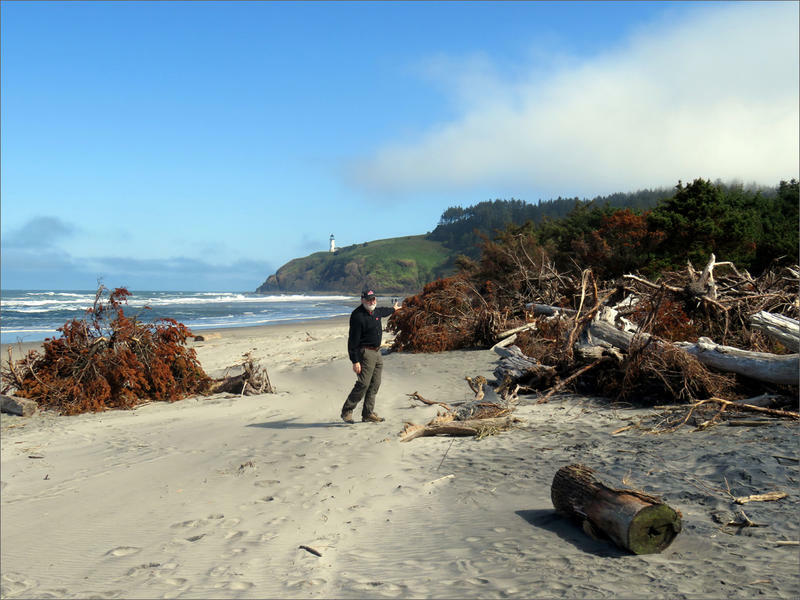 Dale Beasley shows trees killed by saltwater intrusion and erosion that previously fronted the Cape Disappointment State Park campground. Coastal erosion is chewing away at one of the Northwest's most popular recreation areas. It's threatening the main campground and other amenities at Cape Disappointment State Park, which has the second most camper visits in the Washington State Park system. 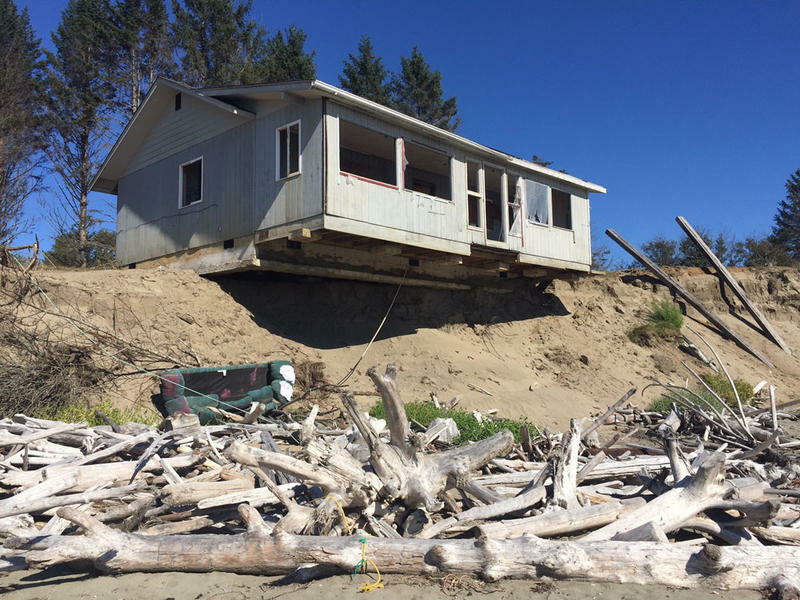 Darrel and Connie Newton of Vancouver, Washington, had advance warning of the shoreline erosion at the Cape Disappointment campground. But the Newtons were still shocked by what they saw when they arrived for a month-long stint as campground hosts. "Last year when we were here, there was a whole bunch of trees and we couldn't see the ocean. This year, everything's wiped out and we have view property now,” Darrel said with a laugh. "The beach is leaving us,” Connie added. “We're losing the park." Storm waves swallowed a barrier dune and claimed 10 oceanfront campsites out of more than 200. Trees killed by saltwater now litter Benson Beach. Dale Beasley, president of the Columbia River Crab Fisherman's Association, is alarmed too. He’s pitching a solution with a possible dual benefit. He proposes the U.S. Army Corps of Engineers replenish the beach with sediment from ongoing dredging of the nearby river channel. Benson Beach with the Columbia River mouth in the far distance, as seen from North Head. "Put it on the beach at at least the rate that we're losing it,” he said. “Being so close to the campground right now, we would want at least for a couple of years to accelerate that and build a barrier dune so the campground doesn't disappear here." Beasley foresees a side benefit from the corps avoiding offshore dumping where the dredge spoils could smother crabs that fishermen want to catch. "We're open to pursuing opportunities for erosion control and continuing to discuss the best options for sediment placement," said Army Corps spokesman Tom Conning in Portland. The Army Corps noted that beach placement is more expensive than offshore dumping and that the cost would exceed what the Portland district currently has funding for. 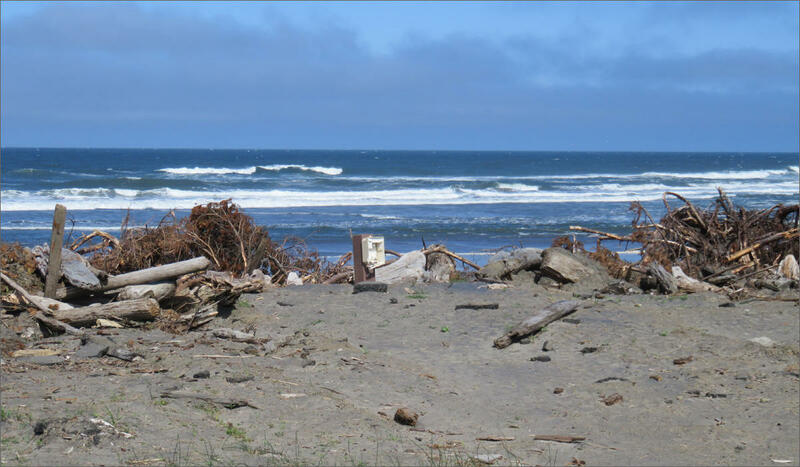 There is precedent for the Army Corps to replenish Benson Beach, the stretch of shoreline fronting the ocean at the Cape Disappointment campground. Beasley recalled that the corps deposited a massive amount of silt and sand onshore as part of a Columbia River dredging contract in 2010. Beasley has a notion of starting a "Save the Park" movement that would culminate with inclusion of money in the next Army Corps of Engineers budget to place fresh sand onto Benson Beach. Meanwhile, Washington State Parks said it's working on a climate change adaptation plan for all of its coastal properties. Stewardship Manager Lisa Lantz said the plan will guide where to make investments and where to relocate visitor facilities. Lantz said the adaptation plan is due for completion in June 2019. A perceived lack of urgency among government agencies aggravates Beasley. He said one fierce storm as soon as next winter could wipe out much of the big campground, giving new meaning to Cape Disappointment. "I was surprised at how much erosion we had last winter on a mild winter," Beasley said. "If we got another winter like we had in 2007, where we had a prolonged storm and vicious seas on high tides, then you'll get massive erosion." Shoreline erosion is typically a wintertime phenomenon on the Northwest coast when storm surges, high tides and high waves compound one another. Spring and summer currents sometimes return sand to the beach in a reverse process called accretion. A winter storm destroyed this prime campsite and nine others at Cape Disappointment State Park. The park campground has more than 200 sites for RVs and tent campers along with 14 yurts. Camping reservations were completely sold out for all of the Memorial Day weekend. The campground hosts, the Newtons, said it is typical for the large facility to be fully booked every weekend in season. Cape Disappointment recorded 117,453 camping nights in 2017 according a state parks spokeswomen, second only in number to Deception Pass State Park. 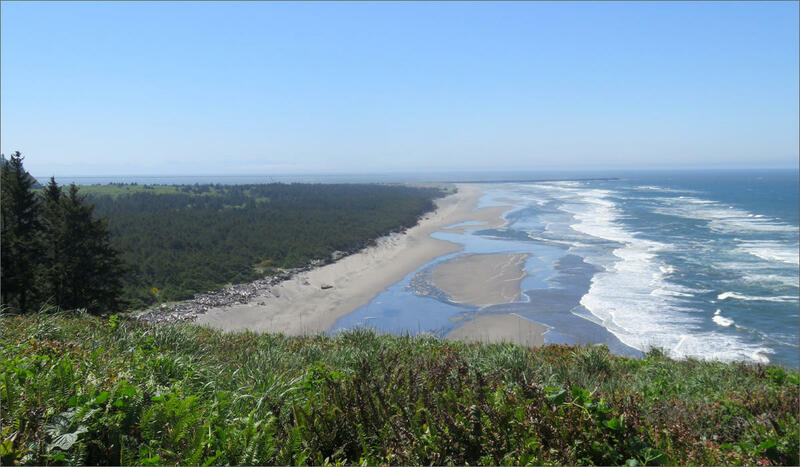 Some of the attractions at Cape Disappointment including two iconic lighthouses and a Lewis & Clark interpretive center are securely located on top of or behind headlands out of reach of the ocean. Around one mile to the north, coastal erosion is threatening to sever the Discovery Trail, a popular, paved bike trail from Ilwaco to Long Beach. Where the trail curves out of forest to meet the dunes it used to be more than 30 feet from the beach. But now it's at the water's edge at high tide.